What companies should know about accounting for their executive compensation packages. The exchange of services for equity creates an accounting expense that must be recognized in the income statement. 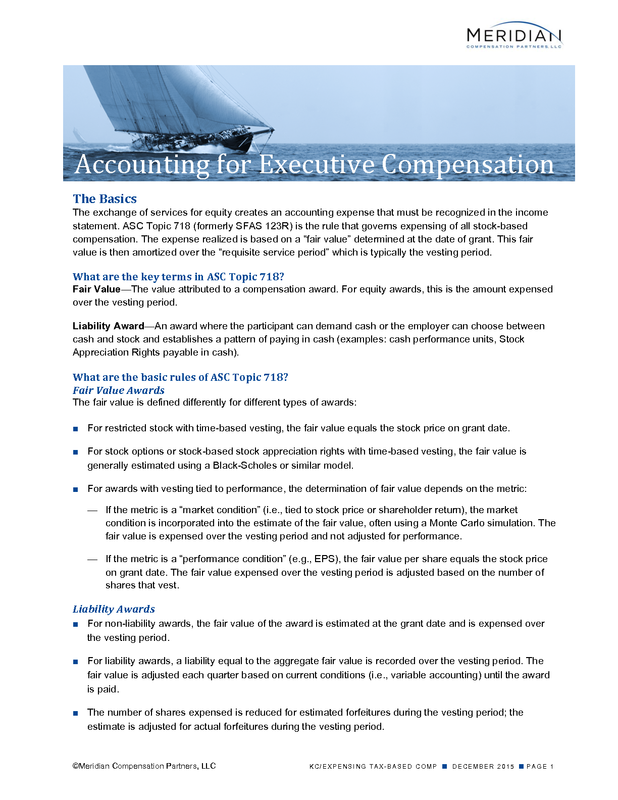 ASC Topic 718 (formerly SFAS 123R) is the rule that governs expensing of all stock-based compensation. The expense realized is based on a “fair value” determined at the date of grant. This fair value is then amortized over the “requisite service period” which is typically the vesting period. What are the key terms in ASC Topic 718? Fair Value—The value attributed to a compensation award. For equity awards, this is the amount expensed over the vesting period. Liability Award—An award where the participant can demand cash or the employer can choose between cash and stock and establishes a pattern of paying in cash (examples: cash performance units, Stock Appreciation Rights payable in cash). What are the basic rules of ASC Topic 718? For restricted stock with time-based vesting, the fair value equals the stock price on grant date. For stock options or stock-based stock appreciation rights with time-based vesting, the fair value is generally estimated using a Black-Scholes or similar model. If the metric is a “market condition” (i.e., tied to stock price or shareholder return), the market condition is incorporated into the estimate of the fair value, often using a Monte Carlo simulation. The fair value is expensed over the vesting period and not adjusted for performance. If the metric is a “performance condition” (e.g., EPS), the fair value per share equals the stock price on grant date. The fair value expensed over the vesting period is adjusted based on the number of shares that vest. For non-liability awards, the fair value of the award is estimated at the grant date and is expensed over the vesting period. For liability awards, a liability equal to the aggregate fair value is recorded over the vesting period. The fair value is adjusted each quarter based on current conditions (i.e., variable accounting) until the award is paid. The number of shares expensed is reduced for estimated forfeitures during the vesting period; the estimate is adjusted for actual forfeitures during the vesting period. Stock Appreciation Rights Fixed expense calculated at grant date using valuation model (e.g., Black-Scholes) and accrued over vesting period. Must estimate forfeitures due to terminations at grant date and adjust for actual forfeitures thereafter throughout the vesting period. Expense adjusted quarterly until exercise as fair value changes; mark to fair value accounting. Stock (time-based) Fixed expense based on share price at grant date accrued over vesting period. Must estimate forfeitures due to terminations at grant date and adjust for actual forfeitures thereafter throughout the vesting period. Expense adjusted quarterly throughout vesting period as stock price changes; mark to fair value accounting. Performance Plan (market condition) Fixed expense calculated at grant date taking into account the market condition and accrued over performance period. Must estimate forfeitures due to terminations at grant date and adjust for actual forfeitures thereafter throughout the vesting period. No reversal of previously recognized expense for awards where performance has eliminated payout. Expense adjusted quarterly throughout performance period as performance changes; mark to fair value accounting. Performance Plan (non-market condition) Fair value per share fixed at grant date. Expense estimated at grant date and accrued over performance period. Expense adjusted quarterly for changes in the number of shares estimated to vest (but not stock price changes). Must estimate forfeitures due to terminations at grant date and adjust for actual forfeitures thereafter throughout the vesting period. Expense adjusted quarterly throughout performance period as performance changes; mark to fair value accounting. Note: If the company has ability to pay award in cash or stock, the company and its auditors will need to determine whether to account for it as stock or cash award based on past history.